Vinyl siding is one of the lowest maintenance cladding products available on the market today. 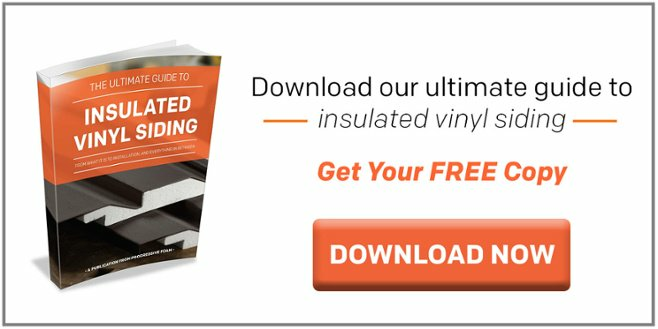 Over the last few decades, manufacturers have been increasingly producing vinyl to strict standards, protecting against fading, cracking, blow offs in extreme winds, and more. One weakness of vinyl siding is the hollow void created between the siding panel and the wall. This gap leaves the siding susceptible to impact damage from flying objects such as hail or a rock thrown from a lawnmower. This risk of damage is reduced when using insulated vinyl siding, which features a contoured foam backer that acts as a shock absorber against impact. In the event your home is clad with standard vinyl siding and has experienced some kind of damage, you will want to repair it right away to prevent any water infiltration or other elements from damaging the wall behind the siding. There are a few options when repairing vinyl siding, although it’s important to check with the manufacturer or your particular brand to make sure you don’t void the product warranty. Begin your inspection from the ground by walking around the house. Since there is a lot of siding on a home, we recommend taking a pen and pad of paper with you to log any type of damage you may encounter, and its location. Popular types of damage you might see are dented or cracked panels, loose or missing panels, and faded or otherwise discolored panels. There are three areas of a vinyl sided home that are generally prone to damage: The base of the wall where the first few panels are, the corners, and the tops of the wall. The base of the wall is susceptible to damage because it is the lowest to the ground and encounters the most traffic. Objects like a rock thrown from a lawnmower or trash cans stored against the house can strike unsupported siding that’s lowest to the ground and cause visible impact damage. Vinyl corner posts that are not filled with insulation also create a large gap which can be susceptible to impact damage. This gap can also serve as a place for birds, bees, or other pests to nest. Vinyl siding in hard to reach areas at the top of the wall can be susceptible to tear offs or other damage if the panels were not properly installed. If the hole is small enough, you may be able to fill it in by applying a generous amount of exterior caulk to the hole with a caulk gun, then scrape off the excess once it dries. Make sure the caulk matches the color of the vinyl siding as close as possible. If you cannot find caulk that closely matches, you can paint the dried caulk with acrylic latex paint for exterior use that is colored to match your siding. There are also patches and stickers available that can be easily applied over the hole. The best option when repairing vinyl siding is to replace the damaged panel. Below are the Vinyl Siding Institute’s instructions for replacing a panel. Gently bend out the upper panel. Take the nails out of the damaged panel and remove it (Fig. 78). Lock the new panel and nail it up (Fig. 78). Below are the steps to repair a damaged vinyl siding corner post. Cut away the face of the damaged corner, leaving the nail hem and pocket intact. Remove the nailing hem from the replacement corner (Fig. 80). Place the new corner over the remaining portions of the old one and fasten it into position with one rivet on either side located at the top of another post. Vinyl siding is the lowest maintenance siding product available on the market today. It requires no painting, staining, sealing, or caulking to maintain it’s like-new appearance. Occasionally wash vinyl siding with mild soap and a garden hose as needed.